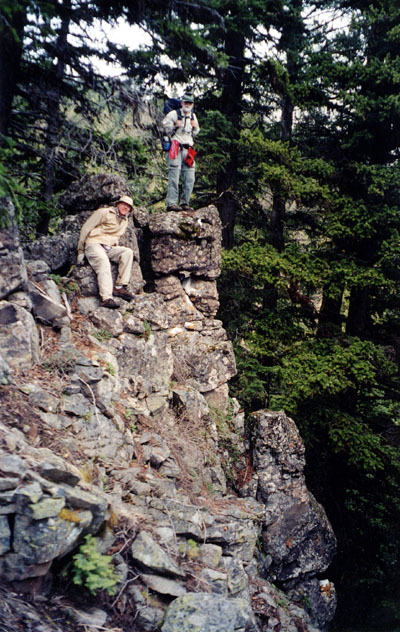 Over the Memorial Day Weekend of 2003 we headed out to a tiny wilderness area in the Ochocos called Bridge Creek Wilderness. It's not very big, but without trails we managed to get ourselves lost a couple of times - even using GPS navigation! We returned for a second visit with a larger party over the weekend of the Fourth of July in 2003, and got lost again, with two GPS units! Update: a forest fire burned most of the forest in the Bridge Creek Wilderness in 2008, so things have really changed. Some of our party returned in the summer of 2013, and the wilderness is beginning to recover. that is the wilderness boundary. The wilderness area is to the left. Once off the road, our way took us through this high meadow. Susan, Joe and Scott approach the edge of the world. Much of the wilderness area is a gently sloping basalt plate. Here at "the edge of the world" the plate abruptly breaks off. Here is what we could see from the edge of the world. then just close the window to return to this page. White Butte on the left, a cairn (with Scott approaching) on the right. We set up camp at North Point, along the rim. A tiny bit of sunset can be seen through the clouds from the door of our tent. lots and lots of blowdown. Susan poses amid the mountain mahogany. Joe and Scott on some nice rocks. something much less common: "Golden Jelly Cone," or Guepiniopsis alpina. 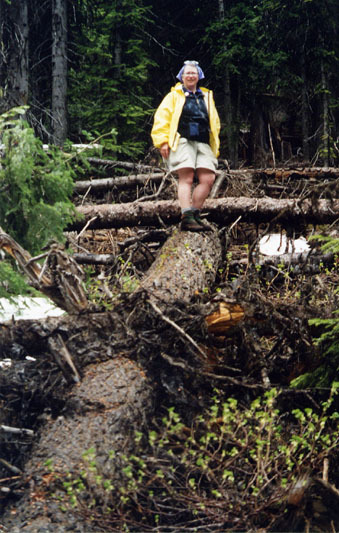 Ellen uses a log as an elevated highway over fallen trees. Heading down in search of Bridge Spring. ...which turned out to be miles away at Bridge Creek. If you look closely you can see the diversion on the left side of the creek. Despite the GPS, we were a bit mistaken about where we were. realizing we should have stayed on the other side. on the other side, too. Rough going! approaches them on the other side. Corn lilies - we saw lots of them. By July a few would actually be blooming. In yet another high meadow, heading back toward camp, we encountered fog. Back at camp, we took this panorama of the view with clouds. Click on the photo for a larger view. Close up of White Butte poking through the clouds. The next morning the sun came out, and we finally saw the whole view. Click for a larger look. White Butte in the sunshine. At first we thought this might be some kind of giant ant, but after I posted this as a query here, I received e-mails from folks who idenitified it as a Blister Beetle of the Meloe genus. Many thanks to those who took the time to let me know!. Here's a good Wikipedia article (and here's a plug to support Wikipedia while you're at it!). If you have plenty of bandwidth, download a short movie of this huge insect crawling over Susan's gloved hand. The movie is about 3 MB. Susan was lucky to be gloved, as it turns out. The Blister Beetle is so called because it exudes an oil that can cause blistering of the skin and painful swelling! Looking back to North Point from the highest point. Trekking across the highest point on the rim. A close-up of "desert pavement" under our feet. 800 feet to where we camped. Watch for falling rocks! This one needed to be moved before we could proceed. This page was finally updated to reflect information about the Blister Beetle on 9/9/13, and further updated with info about Golden Jelly Cones on 11/17/13.